Background and objectives Complement factor H and related proteins (CFHR) are key regulators of the alternative complement pathway, where loss of function mutations lead to a glomerulopathy with isolated mesangial C3 deposits without immunoglobulins. Gale et al. (12) reported on 26 patients with the first familial, hematuric glomerulopathy caused by a founder mutation in the CFHR5 gene in patients of Cypriot descent living in the United Kingdom. CFHR5 nephropathy is clinically characterized by continuous microscopic hematuria whereas some patients present with additional episodes of synpharyngitic macrohematuria, associated with infection and pyrexia. A subgroup of patients, particularly men, develop additional proteinuria, hypertension, and chronic renal disease or ESRD. Design, setting, participants, & measurements We herewith expand significantly on the study by Gale et al., reporting on histologic, molecular, and clinical findings in 91 patients from 16 families with the same founder mutation. Results Eighty-two patients (90%) exhibited microscopic hematuria; 51 (62%), exhibited only microscopic hematuria, whereas the remaining 31 additionally had proteinuria (38%); 28 proteinuric patients developed chronic renal failure (CRF). Among carriers of CFHR5 mutation aged >50 years, 80% of the men and 21% of the women developed CRF; 18 developed ESRD (14 men [78%], 4 women [22%]). Conclusions The diagnosis of CFHR5-related, isolated C3 glomerulopathy was established in 2009 using newly described mutation analysis after decades of follow-up with unclear diagnoses, occasionally confused with IgA nephropathy. This larger patient cohort establishes the clinical course, significant variable expressivity, and marked gender difference regarding the development of CRF and ESRD. Familial microscopic hematuria with or without episodes of macroscopic hematuria, starting in childhood and adolescence and leading to proteinuria, hypertension, and progressive chronic renal failure (CRF; defined as an elevated serum creatinine >1.5 mg/100 ml), has been recognized as a clinical entity for over 100 years (1,2). Until recently, the causes of familial hematuric nephropathies were restricted mostly to mutations in the type IV collagen genes, responsible for the X-linked or autosomal recessive Alport syndrome (3–6). Heterozygous mutations in COL4A3/COL4A4 genes are responsible for up to 40% of families with thin basement membrane disease (7–9). Familial IgA nephropathy may also account for a small number of families with hereditary hematuria (10). However, other, as yet unrecognized causes for familial hematuria must clearly exist, as evidenced by the failure of several hematuric families to show linkage to COL4 genes (11). A recent genetic breakthrough has been the description of CFHR5 nephropathy by Gale et al. based on a Greek-Cypriot family now living in London (12). The CFHR5 gene belongs to a family of five related genes (CFHR1 through CFHR5) on chromosome 1q32; the mutation results in the duplication of exons 2 to 3 that encode Short Consensus Repeats 1 to 2 and causes significantly impaired ability to bind C3b on membranes including the glomerulus (12,13). Our understanding of the regulatory properties of complement factor H (CFH) and related proteins in the alternative complement pathways (ACP) advanced recently (14,15) when some sporadic and familial nephropathies were shown to be caused by loss of function mutations and other defects in the controlling mechanisms of ACP (14–20). In the ACP, no antibody-antigen complex is required to start the C3 cascade and immunoglobulins are notably absent from the deposits on the damaged glomerular surface. Loss of function mutations in important regulatory proteins such as CFH, complement factor I and membrane cofactor protein, were recently detected in patients with inherited nephropathies characterized by isolated C3 mesangial deposits (19–21). Mesangial C3 glomerulopathy has been known histologically at least since 1980 from published reports in Europe and Japan (22–26). The diagnosis was made on renal biopsies of young individuals after episodes of synpharyngitic gross hematuria, persistent microscopic hematuria, and/or proteinuria with normal serum C3 complement levels. Yet this pattern was not recognized as a distinct clinical entity, its familial nature was not clear, and the etiological and prognostic significance of C3 mesangial deposits was not appreciated until the recent description of the C3 glomerulopathy in Cypriot patients carrying a specific CFHR5 mutation (12). In the small number of patients described in the initial report the disease presented with microscopic hematuria, or episodes of macroscopic hematuria associated with upper respiratory tract infections (URTI), clinically mimicking IgA nephropathy. In the present study we have expanded on the initial small study, describing in detail 91 patients in 16 pedigrees. We describe in detail all clinical characteristics and age changes, documenting further the gender effect where men are more severely affected than women. The study was approved by the Cyprus National Bioethics Committee and participants gave their signed informed consent. The first proband had his renal biopsy in 1985, but the molecular diagnosis was established in 2009. All probands and relatives were molecularly tested because they fulfilled one or more of the following criteria: (1) microscopic or synpharyngitic macroscopic hematuria; (2) renal biopsy findings of mild mesangial proliferation with isolated C3 mesangial deposits without immunoglobulins on immunofluorescence, and subendothelial electron dense deposits on electron microscopy; (3) proteinuria, CRF, or ESRD of unknown etiology; and (4) a positive family history with autosomal dominant inheritance. After the original observation by Gale et al. (12), we prospectively collected new families with unexplained microhaematuria while we also screened our DNA biobank for patients with glomerulopathies and no clear-cut diagnosis. Renal biopsies were performed percutaneously as clinically indicated. These were processed for light microscopy and direct immunofluorescence and after 1993 routinely for electron microscopy (EM). For light microscopy, paraffin sections were stained with hematoxylin and eosin, periodic acid–Schiffs (PAS), silver methanamine, and Masson's trichrome. For immunofluorescence, cryostat sections were incubated with a panel of FITC-linked mouse antibodies against human IgA, IgG, IgM, C1q, C3, and fibrin. For EM, specimens were processed as described previously (5,11,27) and photographed in a JEM-1010 transmission electron microscope. Screening for CFHR5 exons 2 to 3 duplication was performed by PCR amplification using primers: 5′-GATTCCATTTGTCAAATATTG-3′, 5′-TCTTCTCCAAAACTATCTAATGTCAA-3′, and 5′-TTTGAATGCTGTTTTAGCTCG-3′ (Figure 1A; for more details see reference 12). Molecular diagnosis of at-risk individuals, which however cannot distinguish heterozygotes from homozygotes, as designed by Gale et al. (12). (A) The presence of the lower band of 222 bp is indicative of the presence of the duplication. As shown on this 2% agarose gel electrophoresis, lanes 3, 4, 7, and 10 represent affected patients in family CY5327 (Figure 2B). (B) Molecular testing, by a long-range PCR method and 1% agarose gel electrophoresis, to detect any homozygotes for the exons 2 to 3 duplication of CFHR5. The 6972-bp band is present only in heterozygotes and normal homozygotes. The 3-kb band is a spurious PCR product (see text). Presence of the 3-kb band and absence of the 6972-bp band is indicative of a successful PCR reaction and a mutant homozygote sample. No homozygous patient was identified. MW, molecular weight 1-kb ladder; 1 and 2, normal homozygotes; 3 and 4, heterozygous patients. This PCR test cannot distinguish homozygotes from heterozygotes, so we designed a long-range PCR amplification, which encompasses the duplicated sequence (Elongase; Invitrogen, Carlsbad, California), using the primers 5′-CCAAAGGACGATAACACTCCTAGC-3′ and 5′-GAGGCCTCAGAAATAACACCAC-3′. Amplification is for 35 cycles at an annealing temperature of 65°C and 1.6 mM MgCl2 concentration. Heterozygous mutation carriers (MCs) are expected to give two PCR bands, with lengths of 6972 bp (normal exons 2 to 3) and 13,274 bp (encompassing duplicated exons 2 to 3). The 13,274-bp fragment failed to amplify on repeated attempts, perhaps because of its large size. The 6972-bp fragment was successfully amplified, as evidenced by agarose gel electrophoresis and restriction mapping (Figure 1B). Interestingly, all samples amplified one additional clean very intense spurious PCR product of approximately 3 kb in size (Figure 1). Therefore, under the conditions of this test, the absence of the 6972-bp band would be a proof of homozygosity for the exon 2 to 3 duplication, as the 3-kb nonspecific band serves as a PCR internal control. No homozygous individual was detected. There were 141 members at risk (i.e., with 1 affected parent), 91 of whom were positive for the CFHR5 duplication (65%), the bias explained by our targeted approach. Patients and healthy relatives belong to 16 apparently unrelated families originating from distinct geographic regions on the island of Cyprus. However, a distant unknown relationship to a common ancestor is highly suggested based on the molecular findings. Molecular examination showed 91 individuals to be MCs (including the 26 patients in Gale et al. ; see also Table 1). Specific examination for identifying potential homozygous patients was negative, using a newly designed long-range PCR that encompasses the duplicated sequence, as described in Materials and Methods (Figure 1). Four families followed over the years 1984 through 2010 are presented in detail here with emphasis on the disease spectrum and long-term clinical characteristics (Tables 1 and 2). Two additional families, CY5388 and CY5399, are presented as Supplemental Figure 1, A and B.
Pedigrees of the four families that are described in the Results section. Black symbols show the affected members. Arrows show the proband. Two other families are available as Supplemental Figure 1, A and B. The proband was first examined at age 36 because of an episode of prolonged macroscopic hematuria. This accompanied an URTI with pyrexia up to 39°C. Previously, he had experienced continuous microscopic hematuria for at least 4 years. A year later, proteinuria of 1.5 g/d was noted and a renal biopsy showed mild mesangial proliferation with prominent isolated mesangial C3 deposits (Figure 3, A and B). The official report described the biopsy as showing “isolated C3 mesangial glomerulonephritis” and suggested a fairly good prognosis. He received treatment only for concurrent hypertension. A male maternal cousin who was known to have CRF had died in 1967 aged 38 years from ill-defined causes. The proband belonged to a large family featuring micro- and macrohematuria, proteinuria, hypertension, and progressive CRF with normal C3 and C4 blood levels and exhibiting autosomal dominant inheritance. The exact diagnosis remained elusive until 2009 when molecular testing confirmed inheritance of the CFHR5 exon 2 to 3 duplication. By 2003, 17 years after the renal biopsy, the proband reached ESRD and a successful renal transplant from his wife was performed. In 2011, he remains well. By this time, 58 at-risk members have been evaluated and 37 carry the mutation, with a variable phenotype. The majority of patients, 23 (62%), show only microscopic hematuria while 3 of them have experienced episodes of gross hematuria. Six patients progressed to proteinuria and CRF, 5 of whom reached ESRD. Eight patients (22%) had no hematuria on a single urine analysis. Two patients have been transplanted and remain well 7 and 9 years later. Three patients had a renal biopsy, all showing the characteristic C3 mesangial deposits (Figure 3). (A) Light micrograph from a representative kidney biopsy in family CY5308 stained with PAS, showing mesangial hypercellularity (arrows) (magnification, ×400). (B) Immunofluoresence from a representative kidney biopsy in family CY5308 showing diffuse granular C3 staining on the mesangium and capillary wall (magnification, x400). (C) Electron micrograph from a representative kidney biopsy in family CY5308 showing the presence of subendothelial deposits (SD) as well as mesangial deposits (MD). A red blood cell (RBC) is seen in Bowman's capsule (magnification, ×8000). Family CY5327 (Figure 2B, Family 3 from Reference 12). The proband was found at age 47 to have asymptomatic microhematuria. The physical examination together with a renal ultrasound scan (US), intravenous pyelogram (IVP), urine cytology, and cystoscopy were all negative. By age 51, in 2002, hypertension was established and treatment was initiated. Serum creatinine was elevated at 1.5 mg/dl. Serum complement C3 and C4 levels were normal. Minimal proteinuria was present at 350 mg/d. In a renal biopsy (November 2002) 4 of 17 glomeruli showed total sclerosis and 5 showed periglomerular fibrosis. The rest showed variable and segmental increase in mesangial cells and matrix (Figure 4A). Capillary walls were of normal thickness. There were arteriolar changes with hyalinosis and occlusion of their lumina. Immunofluorescence showed C3 granular deposits 2+, within the mesangium. On EM, one studied glomerulus showed electron dense deposits within mesangial areas. Discrete deposits were also present in the glomerular basement membrane (GBM) in a subendothelial distribution (Figure 4B). There was an increase in the mesangial matrix and some capillary lumina were partly occluded. The podocytes showed foot process effacement and cytoplasmic vacuolation. Between January 2003 and February 2004 he received eight monthly courses of intravenous cyclophosphamide with methylprednisolone, together with support therapy for proteinuria with angiotensin receptor blockers (ARBs), angiotensin converting enzyme (ACE) inhibitors, and statins. He maintains a serum creatinine of 1.5 mg/dl and proteinuria 0.5 to 1.7 g/d, with no history of macroscopic hematuria. The correct molecular diagnosis was established in 2009. His younger brother presented in 1992, aged 39 years, with several episodes of macroscopic hematuria, after episodes of purulent tonsillitis. On US, the left kidney was small but the right was normal. He recovered and on the same year he had a tonsillectomy with apparently good long-term results. Nineteen years later he only has microscopic hematuria. Two daughters aged 39 and 27 years, one to each of the two brothers, carry the same CFHR5 mutation. They maintain normal kidney function and show only microscopic hematuria. (A) Light micrograph from a representative kidney biopsy in family CY5327 stained with PAS, showing mesangial hypercellularity (arrows) (magnification, ×400). (B) Electron micrograph from a representative kidney biopsy in family CY5327 showing the presence of subendothelial deposits (SD) as well as mesangial deposits (MD). The mesangial matrix (MM) appears prominent. A red blood cell (RBC) is seen in a capillary lumen (magnification, ×8000). This female proband was known to have microscopic hematuria with episodes of macrohematuria since adolescence but repeated renal US and IVPs were normal. At age 56 years she was referred to nephrology with controlled hypertension, proteinuria of 1.3 g/d, and a mildly elevated serum creatinine of 1.4 mg/dl. A renal biopsy in 2000 showed only mild mesangial proliferation on light microscopy with an increase in mesangial matrix (Figure 5A). Immunofluorescence showed fairly intense deposition of isolated C3 within the mesangium and the GBM. Staining for IgA was negative. Two glomeruli examined with EM showed segmental increase in mesangial matrix with electron dense deposits and also thickening of the GBM due to the presence of subendothelial electron dense deposits (Figure 5B). Deposits were also found intramembranously. For 9 years various diagnoses were entertained but the correct diagnosis was established in 2009 upon molecular testing. An affected male relative was transplanted in 1987 and he remains well 23 years later with a serum creatinine of 0.9 mg/dl. (A) Light micrograph from a representative kidney biopsy in family CY5332 stained with PAS, showing mesangial hypercellularity (arrows) (magnfication, ×400). (B) Electron micrograph from a representative kidney biopsy in family CY5332 showing the presence of several subendothelial deposits (SD) as well as mesangial deposits (MD) (magnfication, ×8000). The proband presented in 1996, aged 31 years, with microscopic hematuria and normal renal function. This led to a renal US, IVP, computed tomography, magnetic resonance imaging, and cystoscopy that were all normal. Four years later his microhematuria continued and BP was mildly elevated at 140/100 mmHg. Two years later, in 2002 he had an episode of painless hematuria that lasted for a few days. The serum creatinine was 1.2 mg/dl. There was then microhematuria 200 to 400 RBC/hpf and proteinuria, 380 mg/d. A year later there was again prolonged macrohematuria, this time associated with high fever, vomiting, and diarrhea. A renal biopsy in 2003 excluded IgA nephropathy and a “non specific pure C3 mesangio-proliferative nephritis” was diagnosed. He was given monthly pulses of intravenous SoluMedrol (methylprednisolone), oral daily prednisone, oral mycophenolate mofetil, antihypertensive medications, and omega-3 fish oil. The macrohematuria cleared and by 2005 all immunosuppressive therapy was stopped. By early 2009, the situation was stable, the serum creatinine had settled at 2.1 mg/dl, the hereditary nature of the disease was recognized, and CFHR5 nephropathy was confirmed molecularly. In March 2009 he underwent a urological bladder neck resection for dysuria, complicated by sepsis and fever, and there was gross hematuria with an immediate further rise in his serum creatinine to 3.5 mg/dl with proteinuria. This patient exemplifies well the close relationship between infection and fever with hematuria and a worsening of kidney function. In all 16 affected pedigrees, 184 members were molecularly studied. There were 141 members at risk and 91 (65%) proved to be MC, 43 men and 48 women (Table 1). There were 9 MCs (10%), 8 in family CY5308, showing no urinary abnormalities on a single urine specimen, 6 women (aged 19, 44, 46, 53, 58, and 88 years), and 3 men (aged 12, 49, and 76 years), thereby giving a disease penetrance of 90%. Of the 82 hematuric patients, 51, mostly young MCs (62%), showed only microhematuria, whereas the remaining 31 MCs (38%) exhibited additional proteinuria. Of these 31 patients with proteinuria, 28 went on to develop CRF and 18 of 28 CRF patients reached ESRD at a mean age of 52.1 years, 20% of all 91 MCs. This series of events indicates that the development of proteinuria is of bad prognosis. Figure 6, A through C, divides these 91 patients into four age groups and classifies them according to their urinary findings: (1) hematuria alone or no urinary findings, (2) hematuria with proteinuria, (3) hematuria, proteinuria, and CRF or ESRD. Figure 6A indicates that the patients' renal disease is characterized in childhood, adolescence, and early adulthood by hematuria alone. Under the age of 30, the only laboratory abnormality was microhematuria. Among all 91 patients at least 18 (20%) also exhibited episodes of gross macrohematuria. It is striking how vividly the older patients remember these episodes of macroscopic hematuria that they had experienced in their early lives. As the disease progresses and proteinuria ensues, the prevalence of “hematuria alone” falls progressively (Figure 6A). A striking finding is the marked difference in the clinical progression of the disease between the two genders (Figure 6, B and C). 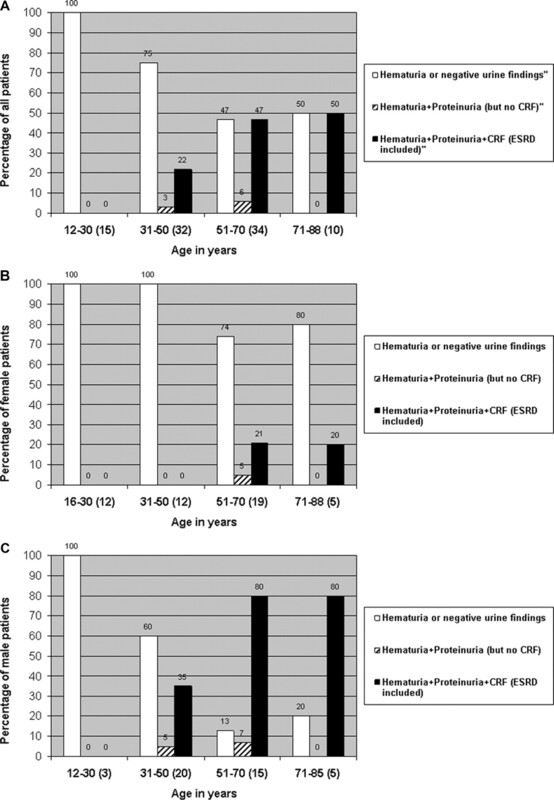 Proteinuria with CRF (including ESRD) was observed in addition to hematuria in 35% of male MCs compared with 0% of female MCs aged between 31 and 50 years. This incidence rises to 80% in men over age 50 years, compared with 21% and 20% in female patients between 51 and 70 years and over 70 years old, respectively. In the entire cohort of 91 patients, 14 men reached ESRD, in contrast to only 4 women (P < 0.0023; Table 2, Figure 7). Of these 18 patients who reached ESRD, 10 patients received 11 renal transplants between 1987 and 2009 with excellent results. One patient had a second transplant. Eight patients are well 1 to 23 years later, all on triple anti-rejection therapy. In hindsight one patient received a kidney from his mother who carried the mutation but was never sick. This did not seem to affect him or her negatively. Prevalence of symptoms (%) among all 91 male and female MCs (6A), 48 women (6B) and 43 men (6C), after classifying them into four major age groups (<30, 31 to 50, 51 to 70, and >70 years). The total number of patients per age group is shown in parentheses on the x axis, more specifically: under 30 years: 3 men, 12 women; age 31 to 50 years: 20 men, 12 women; age 51 to 70 years: 15 men, 18 women; over 70 years: 5 men, 5 women. Under the age of 30 years only microhematuria was encountered in both genders. After the age of 30, it is evident that most male MCs develop CRF in increasing numbers and 14 reached ESRD. In contrast, only 4 women reached ESRD and the great majority exhibit only microhematuria until the end of their lives. 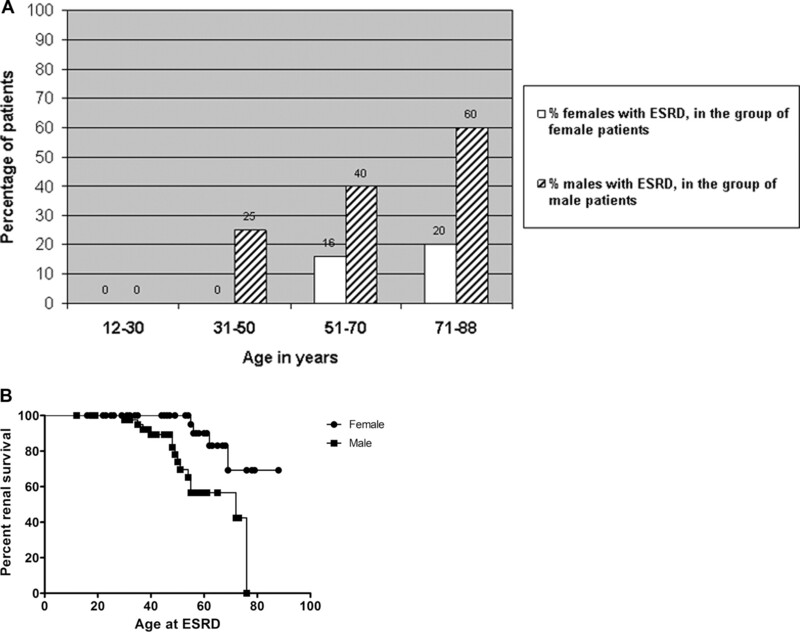 (A) Percentages of men and women with ESRD, according to age groups. Note that the number of male patients is significantly larger than that for women reaching ESRD, at any age. (B) Kaplan-Meier analysis of renal survival by age in men and women separately. There is a significant gender difference documented by a P < 0.0023. Recent work by Gale et al. (12) identified a novel duplication of exons 2 to 3 of the CFHR5 gene in Cypriot families segregating an autosomal dominant form of mesangial isolated C3 glomerulopathy associated with subendothelial C3 glomerular deposits. We have expanded significantly on this renal entity, using our Cyprus DNA biobank on inherited renal diseases. This newly described CFHR5 nephropathy provides a correct molecular diagnosis for many hitherto undiagnosed Cypriot hematuric patients. Interestingly, only one CFHR5 mutation has so far been identified and this provides for an easier population screening. It must be remembered however that other, yet unknown mutations may exist to account for other hematuric families worldwide. Since we established our assay in 2009, we have used this simple molecular test prospectively, as a screening tool for all patients presenting with macrohematuria of glomerular etiology, resulting in the identification of more such families. This test is also currently used in patients with familial microscopic hematuria. Clinical experience suggests that isolated glomerular microscopic hematuria may not be an unusual event, but because this is not generally accepted as an indication for a renal biopsy, the exact histologic findings, like thin basement membrane nephropathy, IgA nephropathy, or isolated mesangial C3 glomerulopathy due to CFHR5 mutations, cannot be easily established. This new molecular test will improve the evaluation and diagnosis of hematuric patients. The present cohort of 16 pedigrees and 91 MCs allows for a detailed analysis of the whole phenotypic spectrum of this renal disease entity. It is evident from Figure 6 that the disease has a distinct course up to the early 30s characterized by microhematuria and episodes of gross hematuria associated with any severe infection with fever, especially URTI. After the early 30s the course is twofold: (1) Life-long hematuria may continue with preservation of normal kidney function, particularly common in female MCs; or (2) proteinuria may ensue, starting at under 1 g/d and heralding the development of hypertension, progressive CRF, and eventually ESRD. This was particularly prominent in male MCs, where 23 (58%) of all 40 men over the age of 30 went on to develop CRF and 14 progressed to ESRD. This marked difference between genders is striking with ESRD developing in 14 men compared with only 4 women (Figure 7B). When men and women are analyzed together (Figure 6A), the findings indicate that over the age of 70, 50% of all MCs show only microscopic hematuria, whereas the other 50% developed additional proteinuria and CRF. It is also worth noting that, in this cohort, very few patients of both genders group with microhematuria and proteinuria alone, suggesting that once proteinuria develops there is a high risk of rapid progression to CRF, rendering the development of proteinuria a bad prognostic sign. Interestingly, nearly all male patients with CFHR5 nephropathy who progressed to ESRD, exhibited in childhood or adolescence episodes of macroscopic hematuria, invariably associated with feverish URTI. Indeed, the two men that reached ESRD at age 30 and 37 years had frequent episodes of gross hematuria early in their lives. This, and the observation that C3 glomerulopathy with rapid progression to ESRD was seen in a female MC at the time of proven bacteremia, is evidence that potent stimulation of the immune system (for example, by Escherichia coli circulating in the blood) is sufficient to trigger clinically significant renal inflammation in CFHR5 nephropathy. These episodes reflect early and more severe damage to the mesangium and the GBM that especially in men may predispose to CRF and ESRD. The clinical picture at the time of macrohematuria appears similar to that of IgA nephropathy and indeed most renal biopsies in these patients were performed with the clinical working diagnosis of an underlying IgA nephropathy, which was never proved. In one affected family in particular (CY5399; Supplemental Figure 1B), where the daughter first exhibited episodes of macroscopic hematuria after URTI, no renal biopsy was carried out and a medical report was sent to the referring physician, describing the illness “as a classical case of IgA nephropathy”. The situation remained uncertain until her younger brother, 10 years later, in 2009, also developed macrohematuria. Molecular testing for CFHR5 nephropathy confirmed the disease in the two children and the asymptomatic father. One wonders if more cases of “familial IgA disease” will turn out to be examples of familial CFHR5 nephropathy. It is important to study further the reasons for the phenotypic heterogeneity between women and men, an observation common in other nephropathies too, which was ascribed in the past to the estrogen-protective effect or more recently to the adverse effect of testosterone on inflammatory mesangial changes (28,29). Specifically, in patients over the age of 50, 80% of men but only 21% of women show renal impairment (Figure 6). Equally important are the different phenotypes among individuals within the same gender. It is possible that MCs who progress to CRF do so under the influence of yet unknown predisposing modifier genes (30), although one cannot exclude that the modifier gene(s) may create a variable age-dependent penetrance. Table 1 (last column in parentheses) tabulates the ages at which 18 patients reached ESRD. It is evident that there is a significant age spread, ranging from 30 to 72 years. Another phenomenon that deserves attention is the sharing of a common mutation among all families, known as founder effect. Geographical clustering of families was initially obvious in our cohort, as eight families originated from three neighboring villages at the Troodos Mountains. Four other large pedigrees originate however from Lakatamia or Deftera (two neighboring villages near Nicosia) and four are from elsewhere. The age of the mutation is estimated to be over 400 years old, this allowing enough time for it to be dispersed in distant geographical regions, even out of Cyprus to England, despite limited travel and movements in older times (12,31). A very interesting possibility is that increased ACP activation (which amplifies the classical pathway response) could have provided a selective advantage, perhaps by enhancing innate mechanisms of bacterial killing, reducing the risk of death in infancy from infection in the preantibiotic era. Another interesting issue regarding the pathophysiology of this disease is that pathogenic lesions are detected only in the kidney. Despite the fact that functional studies (12) showed impaired binding of the mutated CFHR5 protein with C3, there is no obvious explanation for the restriction of the pathologic lesions only within the glomerular mesangium. Apart from the important pathophysiological and diagnostic value that C3 glomerulopathy due to the CFHR5 mutation offers, its recognition offers hope for effective treatment halting its progression to dialysis and/or renal transplantation. The onset of non-nephrotic proteinuria seems to be the key turning point and immediate attention with the performance of a kidney biopsy is essential. At the same time proteinuria alerts to the need for nonspecific therapy such as ACE inhibitors, ARBs, and statins. More importantly, new treatments are already being tried such as plasma exchange, fresh frozen plasma infusions (19), and the use of complement factor H (32). In conclusion, the recognition and molecular diagnosis of CFHR5 nephropathy explain previously underestimated histologic findings in hematuric patients with the central observation of isolated mesangial C3 deposits in the absence of immunoglobulins, indicative of deregulated ACP control due to a mutation in the CFHR5 gene. This entity widens the differential diagnosis of familial microscopic hematuria in childhood and adolescence. It also provides another possible cause for synpharyngitic macroscopic gross hematuria in addition to IgA nephropathy. The phenotype varies from benign isolated lifelong microscopic hematuria, common in women, to the development of proteinuria, CRF, and ESRD, more common in men. However, researchers and clinicians should be alert to the probability of a wider spectrum of symptoms, depending on other novel mutations that may cause different histopathologic and clinical entities, as evidenced by a recent report of CFHR5 mutations associated with atypical hemolytic uremic syndrome (33). The authors express their gratitude to all patients and relatives who participated and made this study possible. We also thank the many clinical colleagues that have recruited patients to this research project. We acknowledge also the contribution of Dr. Adrian Morley, Royal Victoria Infirmary, Newcastle Upon Tyne, who helped with the interpretation of renal biopsies in Cyprus during the 1980s. We thank Prof. Helen Liapis, Washington University, St. Louis, for critical review during preparation of the manuscript. Part of this work was presented in abstract form at the British Renal Society/Renal Association Conference (May 17, 2010; Manchester, United Kingdom), the XLVII ERA-EDTA Congress (June 25–28, 2010; Munich, Germany), and the 16th Panhellenic Conference of the Hellenic Society of Nephrology (June 2–5, 2010; Kos, Greece). The work was partly supported from the Cyprus Research Promotion Foundation, through the grants ΠΕΝΕK ΕΝΙΣX/0505/02, and ΠΕΝΕK/ΕΝΙΣX/0308/08 to C.D. and through the University of Cyprus Articles 3/311 and 3/346 (C.D. ).